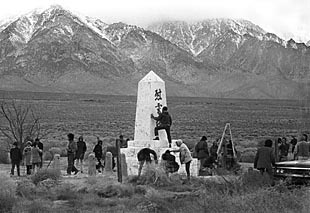 Pilgrimage documents how Japanese Americans transformed Manzanar into a place of empowerment. Photo by Robert A. Nakamura. Nakamura, a graduate student in the Social Documentation Program at UCSC, has created a 22-minute documentary that has been accepted in the "short film" category of the prestigious film festival. The film, Pilgrimage, tells the story of how Japanese Americans have reclaimed the World War II concentration camp at Manzanar, transforming it into a symbol of solidarity and empowerment. Pilgrimage will screen four times during the festival, which runs January 17-27 in Park City, Utah. "I really didn't think I had a chance at all of getting in," said Nakamura, a Los Angeles native who was drawn to UCSC's program because of its focus on using film, radio, and photography to make social change. His goal is to produce films that will engage and educate young people, and he is looking toward a career in education. Nakamura remembers falling asleep during high school history classes and says he only passed his AP history class by watching documentaries on the History Channel. "There's a specific group that film reaches--people like me," he said. "I didn't like school. As a kid growing up, I felt the history I was learning in class wasn't relevant to myself, or my family--and even when it was relevant, it was boring and outdated," said Nakamura. "My goal is to reach the kids who don't see anyone who looks like themselves in their books." Nakamura, 27, infuses the soundtracks of his films with hip-hop music, and his thesis project is a film biography of Japanese-American folk musician Chris Iijima. "He and his singing partner were like the Bob Dylan and Joni Mitchell of the Asian American movement of the 1960s," he said. "I wanted to make a film about the music and culture of that movement." Although his parents are documentary filmmakers, Nakamura didn't explore the medium until he was in college, when he discovered film as a tool for community organizing and social activism. As an Asian American studies student at UCLA, Nakamura made his first film, Yellow Brotherhood, about a youth basketball team in Los Angeles. The team was made up of the children of the founders of a Japanese American anti-gang self-help organization called Yellow Brotherhood. After earning a B.A. in 2003, Nakamura began work on the project that became Pilgrimage, another story that touched his family. Nakamura's father, as well as his maternal and paternal grandparents, were incarcerated at Manzanar, the desolate internment camp about 250 miles northeast of Los Angeles. His two uncles were born there. After the war, his relatives, like most Japanese American survivors of the camps, never talked about their experiences. "The government hid history from the country, and many Japanese Americans hid it from their families," explained Nakamura. "My dad said it was like a prison record--something you don't talk about." But Robert Nakamura participated in the first pilgrimage to Manzanar in 1969, which was organized by Japanese American activists inspired by Martin Luther King's 1963 March on Washington and Cesar Chavez's March from Delano to Sacramento. Pilgrimage tells the story of how Manzanar was transformed from a place of shame into a place of empowerment, and the film draws parallels between the treatment of Japanese Americans during World War II and the harassment of Arab Americans in the post-9/11 era. "My father's generation inspired the older generation to talk about what happened. My role, my generation's role, is to make it relevant to what's going on in the world now," said Nakamura. "I think the older generation appreciates me trying to tell their story to the next generation that's coming up." As an emerging filmmaker, Nakamura was drawn to UCSC's two-year Master's Program in Social Documentation for its commitment to work that has an impact outside academia. "I was attracted to the program's commitment to social change," said Nakamura, who will graduate this spring. "It's a unique program. Most film schools focus on narrative, feature-length fiction films. No other school is offering a similar program." And Nakamura was eager for the opportunity to work with award-winning documentary filmmaker Renee Tajima-Pena, an associate professor of community studies. "As an Asian American studies student and a Japanese American, she's one of my heroes," he said. "The faculty I've been able to work with have been amazing. Working with (professor) B. Ruby Rich is huge. It's a big privilege. And (lecturer and filmmaker) Spencer Nakasako is another of my mentors." With Pilgrimage well underway when he arrived at UCSC, Nakamura spent much of his first year finishing the film and producing a DVD for distribution to high schools and colleges. "I spent a lot of the spring touring, showing the film on college campuses and at community events," said Nakamura. "As with every independent artist, you have to do everything yourself. There's no distribution company, no corporate money. We have to learn to do things ourselves." He is committed to making documentary films with the same aesthetic appeal and production values as mainstream movies, eager to bridge the gap between entertainment and "political" films, and Nakamura is gratified that the audience for such work appears to be growing. "It's pure luck that I'm an emerging filmmaker at this time. Getting into Sundance gives someone like me encouragement and confidence," he said. "I'm taking it as a once-in-a-lifetime opportunity."